NR, utd. is back from SIEGE 2018 and it was an exciting show with many developers from across the country discussing and sharing their experiences. If you’re a part of the game developer industry or looking to join the game developer industry, especially in the south-eastern corner of the US, it is a must go to. It is a great gathering and a chance to network with talent you normally don’t get to meet in person. This year’s guest of honor was James Portnow of Extra Creditz. Day 0 of SIEGE was actually hosted by the Unity Atlanta group to provide a group of Unity developers to showcase their works before the show begins. Not all of the games that showed up during that day were available for the actual show of SIEGE but provided a few first looks. It also gave a chance for those displaying during SIEGE to test their booth setup before the show begins. Day 1 of SIEGE was a bit of a casually slow start as people rolled in and got their feel of the event and a good, steady show of people throughout the day. 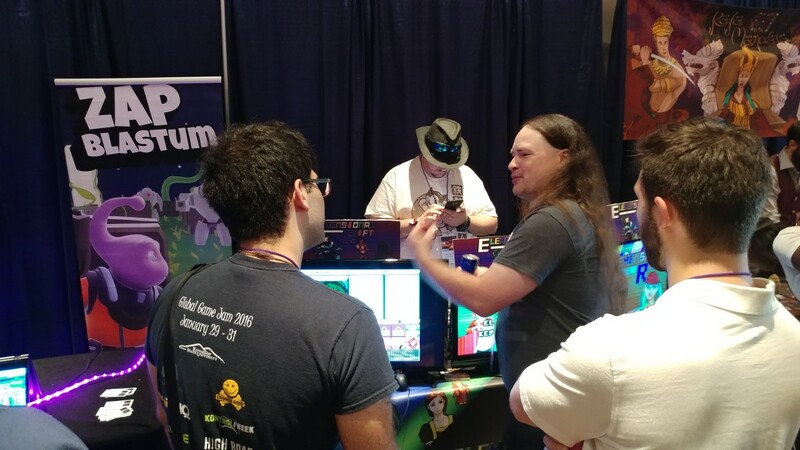 For the end of the night, a few of the developers brought their games over to the ballroom to allow for further playtesting and showcasing. Elemensional Rift happened to be one of the ones joining the ballroom showcasing. Day 2 of SIEGE was more of the big showcasing day and it was a bit of a long one. Not only was there much more foot traffic but several events returned activity back to the Indie Cluster area. Elemensional Rift also was generating a good bit of return players as well. Later that evening, a couple of the games were brought upstairs to have their own small tournaments. 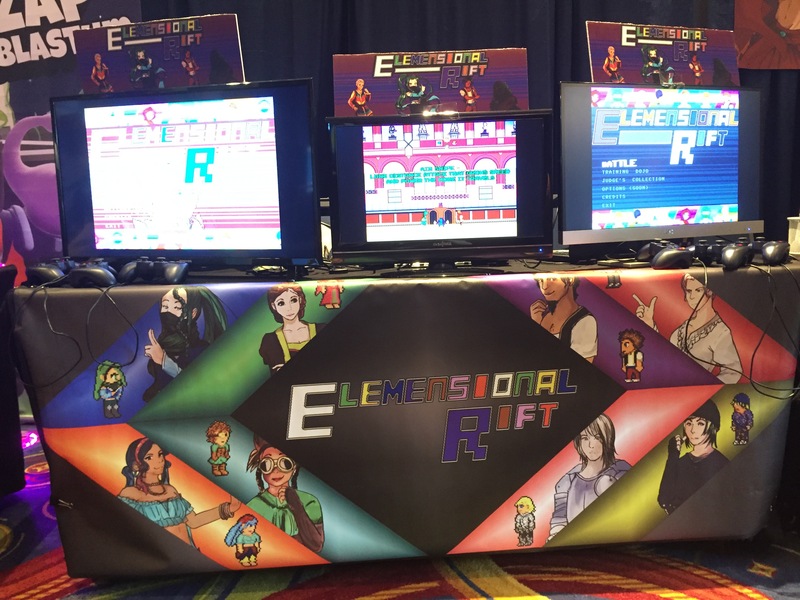 Elemensional Rift happened to be one of the games brought up to the late night festivities. The winner of the Elemensional Rift tournament turned out to be Kevin Dressel, the developer of Zap Blastum! Day 3 of SIEGE was a much more casual and calm day as people were packing up and getting ready to head home. Loose ends of networking were tied and final farewells were given. 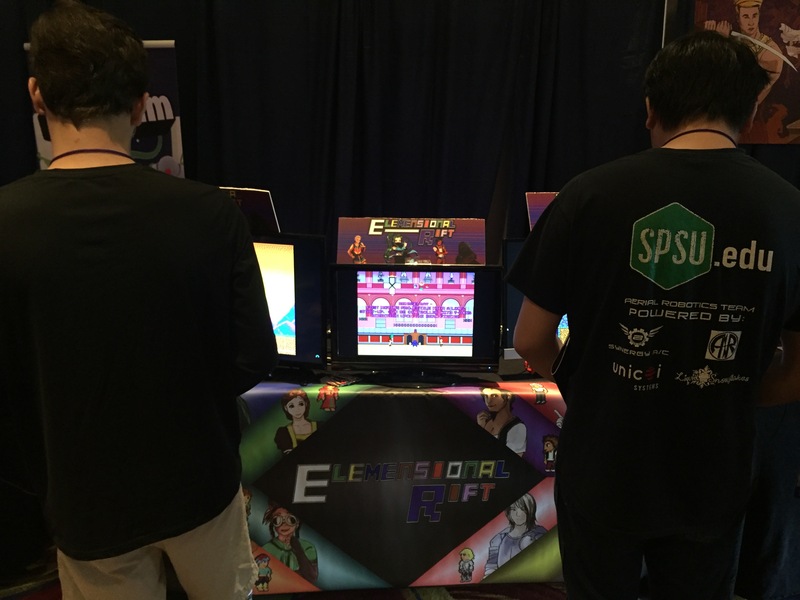 There was also a good list of feedback for Elemensional Rift, which has been heartily been going through and dissecting the feedback to make things even better for Dreamhack: Atlanta just around the corner to keep in touch for.